While our natural instinct is to use big muscles, good shooting requires precise small muscle control. Every time I go to the range, I see new(er) shooters missing a lot of targets. That’s to be expected, as shooting is a skill that like anything else, requires practice. Yesterday, while doing some “work” at the range, it occurred to me that many of the challenges we face as developing shooters are the result of our wiring. Like any other critter, we have natural instincts that have generally served us well over the long haul. Back when we were doing cage matches with sabertooth tigers, certain instinctive moves were pretty helpful. Also, back when we humans were invented, guns weren’t on the scene, so we didn’t necessarily have any built-in manual of proper handgun operation. When they pick up a handgun for the first time, especially when it’s without knowledgeable instruction at hand, most new shooters make the same mistakes. These observations aren’t intended to be a criticism against new shooters. It’s more the opposite. I have to wonder if the reason almost all new shooters make the same mistakes is a result following pre-programmed instincts. Here are some of those wired-in habits I’ve seen and how to correct them. 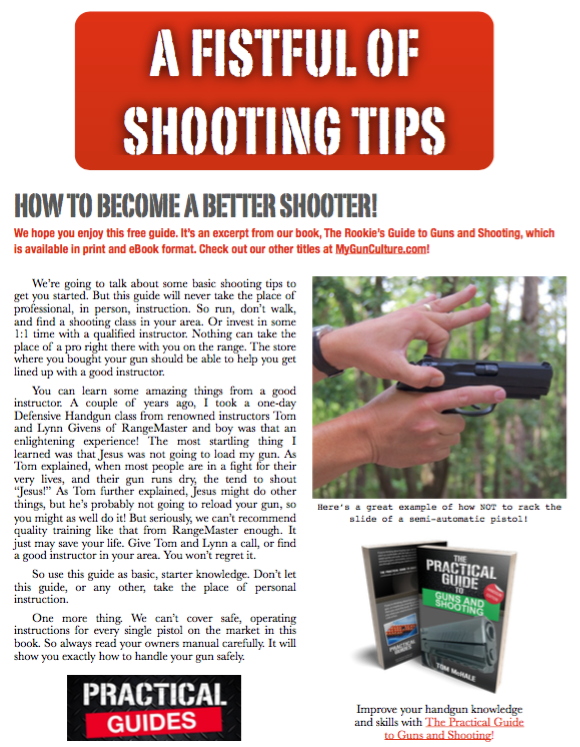 When we first start shooting, we have an irresistible urge to achieve perfection. After all, how hard could shooting be? Aim at something, pull the trigger, and hit it. Except we all know that for some reason, it’s never that easy. If you watch a new shooter, you’ll notice that they aim at the target and at some point, suddenly yank the trigger to break the shot. That’s because none of us are completely steady when holding a handgun – those sights just insist on moving around on the target. When they’re lined up just perfectly, we try to pull the trigger quickly, before the sights move off target. We’re trying to “time” the shot for the exact microsecond that the sights are perfectly aligned. When you think about it, we’re naturally predisposed to “time” rapid movements. Think about how we perform important activities like swatting flies. You can’t hang around and smack it at your leisure, else that winged demon from hell will be long gone and biting some other part of your body. You have to swat that big at a precise instant. The same concept probably applied to our cave-dwelling ancestors. When they had to punch a mastodon in the nose, they probably didn’t pause to aim for the left nostril rather than the right. I figure they got somewhat on target and let fly.